Huawei quietly announced a new MateBook laptop at an ongoing conference in Shanghai. This one is the 2019 MateBook E – which is a 2-in-1 convertible laptop running Windows 10. But the biggest difference with the model this year is it no longer relies on an Intel processor, but makes use of the Snapdragon 850 CPU – essentially an overclocked Snapdragon 845 intended for use in machines running Windows 10. The following video and hands-on photos were published by NotebookItalia. The machine is somewhere between an iPad Pro and a Microsoft Surface. It has a built-in kickstand to prop the machine up either in tablet or computer mode (with the keyboard attached) and it’s got always-on LTE connectivity thanks to the Snapdragon 850. This is Huawei’s first always-connected PC. There’s also a built-in eSIM and a side-mounted fingerprint scanner. 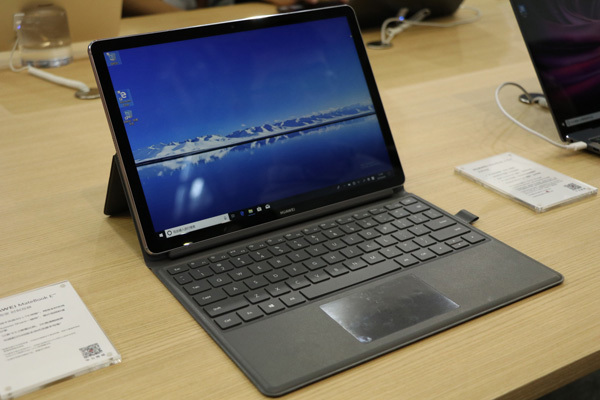 Its specs are mostly similar to the previous-generation MateBook E. It has a 12-inch QHD screen in a 3:2 aspect ratio – one that Huawei prefers to use on its laptops. It has two models supporting either 4GB LPDDR4x RAM + 128GB of storage, or an 8GB + 256GB configuration. The MateBook E has a detatchable keyboard, though it isn’t backlit. There’s also Huawei’s M-Pen compatibility with 2,048 pressure level sensitivity. Huawei is anticipated to release the new MateBook E in China starting at CNY 3,999 (~$595) for the 4GB + 128GB model. The 2-in-1’s availability for western markets including Europe and the US have not yet been revealed but the device can already be purchased on the Huawei Mall website from China. The verdict is still not in about whether a PC running a Snapdragon 850 is worth the price. Aside from the long-lasting battery life, many professional-grade software including 64-bit applications cannot run natively on the machines as they can on machine with a desktop-class non-ARM CPU. don't believe what USA announces. such big company value 100B USD will not do it.